Of all the things I make with produce from my garden, this salsa is the hands-down favorite. I don’t know why, but my children–who would normally not touch a raw tomato with a 10 foot pole–devour the stuff. Well, I guess I do kind of know why. It is pretty amazing! There’s just nothing quite like fresh, homemade salsa, is there? You can use whatever tomatoes you have handy for this recipe. I have several colors and varieties of large and small tomatoes growing in my garden, and I used them all. It really makes for a beautiful presentation, as far as salsa goes. I also like to throw in a few cumin seeds, which gives the salsa a real rustic, earthy flavor, but that is totally optional. Really, nothing about this recipe has to be done exactly as written (except for roasting the jalapenos–don’t skip that part!). If you have an extra tomato, or you really like cilantro, feel free to change things up a bit. 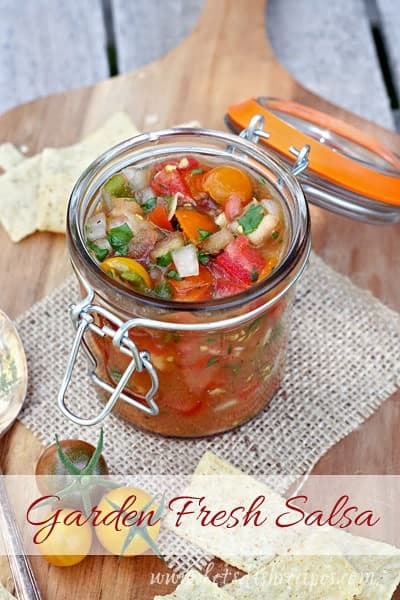 This salsa will keep in the refrigerator for 5-7 days–if it lasts that long! Preheat broiler. Slice the jalapenos in half lengthwise, removing the stems, ribs, and as many of the seeds as you would like (the more seeds you leave, the hotter the salsa will be). Place jalapenos, skin side up, on a lightly grease baking sheet. Spray or brush jalapenos with a thin layer of oil. Place under the broiler and roast until the skins begin to blacken, 3-5 minutes. Cool. Meanwhile, in a large bowl, combine diced tomatoes, onion, cilantro, salt, pepper, garlic, lime juice and cumin seeds. Chop cooled jalapenos and add to the tomato mixture. 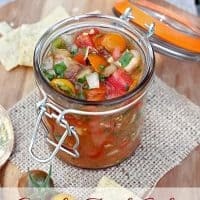 Transfer salsa to an airtight container and refrigerate until serving. Remember to follow along on Facebook, Twitter, and Google+, or follow the Farmers’ Market and Garden Recipes board on Pinterest for the latest market fresh recipes.